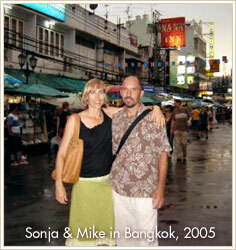 My name is Mike McGinnis, owner of www.whirledplanet.com and www.IndiaSilver.com. I started this company in 1996 on a lark as a way to finance a trip I took to India . I figured I could pick up some silver jewelry and maybe defray the cost of airfare. What happened next is truly magical. With a $500 investment, I began an odyssey that provided me with the vehicle to work for myself doing something I really enjoy. By selling to friends who loved the jewelry, I doubled my initial investment immediately on my return home. Then, I faxed my new supplier in India and told him to "send more jewelry." I couldn't keep it in stock! It sold as fast as my first shipment. I continued selling and reinvesting in more Indian and Asian silver from creative artisans at low prices. To meet the growing demand, I soon started a website and printed a silver jewelry catalog. I found my niche in the online wholesale trade and, for the past 7 years, Whirled Planet has been my full time job. We have a couple of great employees that help pull, pack, and ship orders. In 2004, we opened our first retail store on the island of Kauai , Hawaii . We now sell a mix of products in our local Kauai retail store that is almost entirely derived from our wholesale website. In 2005, we opened a second retail store in Kauai that also does very well and sells the same mix of products. We are now considering a franchise. The retail stores, like our online wholesale business, offer unique products at great prices. On this wholesale site you will find plenty of profit potential. Some of the products show a recommended retail, but in general we suggest a 300% markup, especially with the wholesale silver jewelry. It's also a great value for your customers. Since we specialize in personalized service, we're always available to answer questions about our wholesale products and about our strategy. We offer volume discounts, shipping is very reasonable due to our great relationship with FedEx, and we offer a no-questions-asked return policy on all silver jewelry, wholesale accessories, and home decor. We stand behind all our wholesale products 100% and strive to maintain our reputation for excellent service and great value for customers. Email your questions or thoughts anytime.